I love a subtle hint of color on my skin this time of year. I don't go after deep tans that look unnatural, but a little bronze glow never hurt. I've been using a few Vita Liberata products that provide a soft, natural color to my skin without looking overdone - the Body Blur Skin Finish, Self-Tanning Night Moisture Mask, and the Self Tanning Anti Age Serum. Body Blur Skin Finish | For an instant hint of color, this skin finish is an easy, blendable lotion that washes off at the end of the day. It minimizes the look of skin imperfections and evens tone for a beautiful, flawless finish. This time of year my sensitive skin is prone to irritation which causes redness and discoloration. This lotion covers it right up without the commitment of a long-term tanning lotion. Along with the other Vita Liberata products mentioned, this lotion is formulated without parabens, sulfates, petrochemicals, and harsh chemicals. Anti Age Serum | For an incredibly flexible tanning product, this serum can be applied to skin directly, or mixed in with your moisturizer. I prefer to mix it in with my moisturizer for a very soft hint of color. You simply add 1-3 drops, depending on the intensity you want. It doesn't give a deep tan, just a subtle glow to enhance the skin while still looking natural. This double-duty serum also provides anti-aging benefits with natural and organic extracts. Self-Tanning Night Moisture Mask | This moisturizer works overnight to provide a subtle tan to enhance your skin. It's formulated with HyH20 Technology which provides intense hydration and anti-aging benefits. There's also good news for those of us with oily skin because this product also helps control oil production. It's a fantastic multi-tasker to incorporate in your nighttime routine! 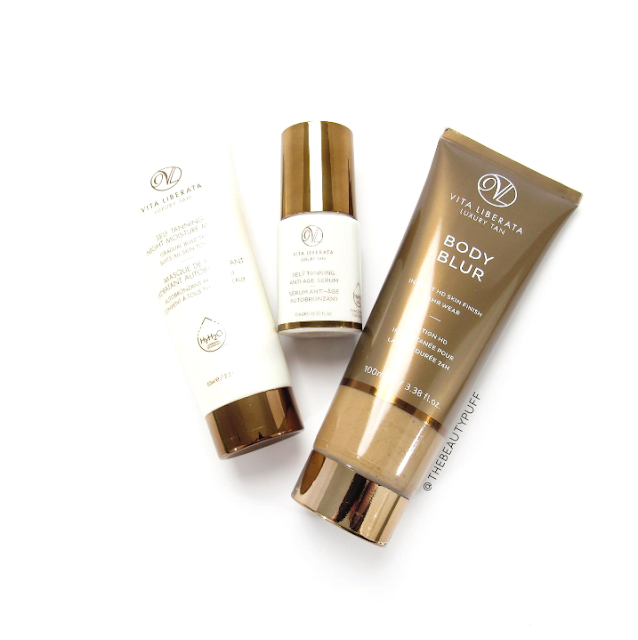 Keep your glow going all summer with Vita Liberata. Shop the entire collection below.